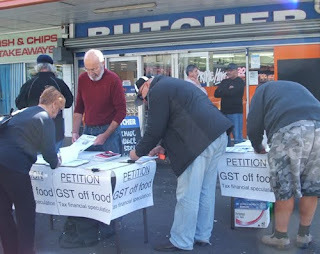 The tax petition to remove GST from food and tax financial speculation was well received at the campaign launch on Saturday. The numbers tell the story, with nearly 900 signatures collected at the seven petition stalls organised around the country. The stall in Auckland outside the Onehunga supermarket was particularly successful, with nearly 300 signatures collected over three hours. Some people took away bundles of the petition to collect signatures themselves. A dozen people helped out on the stall. A steady stream of positive feedback on the campaign, and evidence from Saturday’s stalls, suggests that the petition and its demands are going to connect with the majority of people. Especially after the reality of National’s budget starts to sink in. Factor in inflation, on top on the GST hike, and most people will either be no better off or receive only a tiny benefit from the income tax cuts. National’s budget delivered to the rich, not grassroots New Zealanders. That’s why a broad campaign for tax justice is needed. Removing GST from food would provide an instant and lasting benefit to ordinary people struggling to pay the bills. This common sense tax cut could easily be funded by taxing financial speculation. Over the next few weeks and months what’s going to matter most, is numbers. The more signatures we collect the more support we’ll attract from individuals and groups. And if we start to record really good numbers of signatures, we’ll be more likely to get local and national media attention, essential for growing the campaign. You can help by collecting signatures from friends, family and workmates. Every little effort will count. To download a copy of the petition click here. Or if you want to be sent copies of the petition directly, email campaign coordinator Vaughan Gunson svpl(at)xtra.co.nz or ph/txt 021-0415 082. 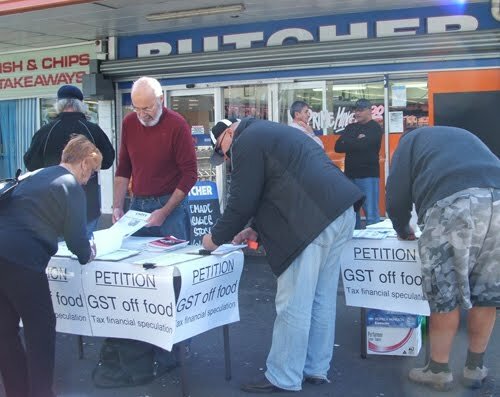 If you would like to help out at tax petition stalls – like the one in Auckland above – in any centre where we have organisers, get in touch with us. If we don’t have a local organiser in your centre, you can become the organiser. We can give you some advice and other assistance. Contact Vaughan (as above).